THE BARRISTER BRIEF: Do I Have to Consent to a Police Request to Search? Do I Have to Consent to a Police Request to Search? "No." That's the simple answer to the ever important question: "do I have to consent to a police request to search?" Unlike others of my "maybe" lawyerish answers that some might consider not totally helpful in their lack of definitiveness, consent to search is clear cut - at least in Canada. Police questioning is totally different from polices searches as to whether you have a choice or not in responding. Sometimes you must answer police questions, depending on what they are asking about. And sometimes it's in your best interests to answer police questions in an attempt to clear up suspicions and avoid being charged, even if you aren't obliged to answer. But never do you have to consent to a search. Either the police have powers and grounds to search, or they don't. It's only when they don't have grounds that they might ask you a question after a highway speeding stop like: "you mind if I take a look in your trunk?" And sometimes if you do say "no", you might get a response like "hey, if you don't have anything to hide, why would you say no?" Your best response is to remain firm and polite in your "no." At the very least, call a lawyer for advice. Sometimes, the police might even pull out a form for you to sign, which says that you've been told: (1) you don't have to consent, (2) that you can withdraw your consent at any time, and (3) anything found during the search can later be used against you as evidence in court. Now reading this, you might be thinking: "Why would anyone consent? I would certainly never consent! I'm not that stupid!" But thousands of people a year throughout Canada (and in other countries with similar constitutional protections against unreasonable search and seizure, like the United States) do just that, and consent to searches where the police have no grounds to search. Some even carefully read those forms, do understand them, but sign anyway. Why? It seems to be something to do with people feeling that: (1) they have no choice, (2) they have nothing to hide, or (3) even though they do have something to hide, the police won't find it, and this is the best way to get rid of them. These "yes" men and women are wrong on every count. First, you do have a choice if the police ask if you mind if they do a search. Be it a search of your vehicle, a search of your house or office, a search of a bag you are carrying, or a search of your person, just say that you do mind. Be polite about it. You can even ask whether the police will go ahead without your consent, because they have some kind of other authority. Sometimes the police will already have - or have sufficient grounds to obtain - a search warrant to search your vehicle, house or office. If they do, then your consent is irrelevant. Don't try to stop the police from executing a warrant (or otherwise conducting any kind of search), unless you want to be charged with obstructing justice. But they must get the warrant from a judge or justice before conducting a search, or have some other kind of lawful power to search without consent. Sometimes the police will already have grounds and powers to search without a warrant incident to arrest. Again, if they do, then your consent is irrelevant. 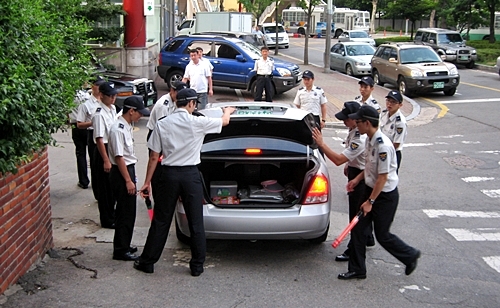 But they must have first arrested you, told you what you are being charged with (unless it is an emergency), and not exceed the limits of the search incident to arrest power (usually limited to your person and what you are carrying - though occasionally it might extend to a vehicle you are in; it will never extend to your whole house or office). Sometimes the police will be able to invoke exigent circumstances to search without a warrant or arrest if there is an emergency situation, where the search just can't wait. Again, your consent will be irrelevant. Though be aware that true exigent circumstances searches are very rare, since the police do have investigative detention powers to hold you, your vehicle, or even your home or office for a reasonable period of time pending the arrival of a search warrant. If my police powers to search explanation is starting to sound a bit complicated, that's because it is complicated. Lawyers and judges disagree frequently about when particular powers exist, and well intentioned police officers can certainly get it wrong if the judges are having trouble getting it right. Though throughout the training I still do for police officers, the best mantra to repeat is: "if in doubt, get a warrant." If you are the subject of a police search, and something incriminating is found that leads to you being charged, my recommendation is to consult a lawyer about your prospects for challenging the search in court. You can challenge a consent search as well. I'm not saying you are guaranteed success on such a challenge, but in my experience most people never challenge police searches. Sometimes a search will be completely legal, and sometimes it won't be. But only by involving a lawyer will you be able to find out which category your search falls into. While serving as a Federal Prosecutor, I once was involved in a case where a BMW speeding along the TransCanada Highway was stopped by police for a traffic violation. The stopping officer only had grounds for a traffic violation, but his suspicions were quite appropriately aroused. The occupant of the fancy car seemed overly polite when stopped. And overly nervous, constantly shifting in his seat, eyes darting about, hands tightly gripping the steering wheel. Plus the vehicle had out-of-province plates, and the conscientious officer remembered from his training that fast food wrappers strewn about a car might be a sign that the occupants were driving non-stop over a great distance for illicit purposes. So, after giving him a speeding ticket, the officer asked the driver if he minded if the officer took a look in the trunk. This officer was very well trained, and made it clear to the driver that he didn't need to consent, that he was free to go, and that anything he found could be used against the driver in court. The officer even pulled out a consent form for the driver to sign. Now what the officer definitely didn't know in advance was that the driver had 10 kilos of coke and $100,000 in cash in the trunk. And what do you think that driver did: he signed, and popped the trunk! See www.defenceeast.com to learn more about your rights concerning searches with a warrant and searches without a warrant.